The Battle of Gettysburg was the deadliest battle of the Civil War. It is estimated that between 46,000 and 51,000 soldiers from both armies died during this three day battle. 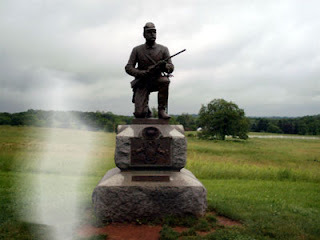 Today, Gettysburg Pennsylvania is said to be one of the most haunted places in America with believers flocking to Gettysburg visit areas haunted by dead soldiers. Part of the battlefield known as the Devil’s Den is said to be particularly susceptible to paranormal activity. There, Confederate sharpshooters would hide behind large boulders and shoot Union soldiers who passed through. These sharpshooters are believed to have killed hundreds soldiers before they were discovered and killed by the Union army. In this area, visitors have reported to have their cameras malfunction, pictures not develop, and apparitions appear in the background of pictures. Another center for paranormal activity is the Farnsworth House. On the first day of battle, this home was taken over by Confederate sharpshooters. A sharpshooter at this location was said to have accidentally killed Jennie Wade, the only civilian killed during the three day battle. Paranormal activities reported at this location include footsteps, apparitions, objects moving, ghosts touching, and the smell of cigar smoke. Scientists have long been skeptical of ghost sightings. According to the Committee for Skeptical Inquiry, there is no scientific evidence that proves any location is inhabited by spirits of the dead. They go on to explain that air pressure changes in a building can cause doors to slam. Also they believe that pareidolia, the innate tendency to recognize patterns in random perceptions, is what causes people to believe that they have seen ghosts. Finally, the committee points out that ghosts seen out of the corner of one’s eye are most likely caused by the sensitivity of human peripheral vision which is more likely to misinterpret sights when the brian is tired. I understand why people would believe that an area where so many people died is haunted. However, I believe that one is more likely to think that they have seen a ghost when they travel to Gettysburg specifically to experience paranormal activity. It seems that those who believe in ghosts are more likely to think that every unusual noise, smell, or feeling that they experience is evidence that ghosts exist. Yeah, I think many ghost sightings can be attributed to a sort of self-fulfilling prophecy, where people see ghosts in everything because they go somewhere expecting to see ghosts. That's the human mind for you.